This is a great question and presents the perfect opportunity for me to explain the roles that content, and the different types of content, will play in the success of their website. “Marketing” content is made up of all the articles, blog posts, white papers, ebooks, slideshows, videos and podcasts included on a site. This content should be useful, original, credible and friendly (more about these points below). “Marketing” content is the most effective way to continually drive organic (non-advertising) search engine traffic to your site. This is called, “Inbound (or Content) Marketing“. This infographic details the four key elements that all types of marketing content must have in order to be effective at driving traffic to your site. To help answer that question, both for them and for you, below is an infographic that details the four key elements that all types of marketing content must have in order to be effective at driving traffic to your site. 4 Ways to Use Tumblr to Connect With Customers: Tumblr has been around for a while and this post explains why it’s worthy of consideration when developing your marketing strategy. How to Build — and Keep — an Engaged Audience [INFOGRAPHIC]: This infographic contains some great tips for engaging your customers by utilizing different online tactics. How to Write the Perfect Blog Post: Love this infographic which breaks-down a blog post into sections; each of which packs a marketing punch. 22 Ways to Create Compelling Content When You Don’t Have a Clue [Infographic]: This is a great tool for those times when your content inspiration runs dry. Seducing Moving Targets: Four Rules for Luxury Brand Mobile Content Marketing: Tips that can be used for any brand. How to Add Google Author Tags to Your Blog for Improved Search Results: A little geeky, but a straightforward way to garner more attention on Google’s search engine results pages. Why Every Online Business Needs a Welcome Email: Is a welcome e-mail really necessary? This posts argues, “Yes” with some very compelling points. 5 Reasons Why You Need a Content Managed Website: I am a huge fan of building sites on top of a web content management system (e.g. WordPress, Joomla, Drupal) – this post explains why you should be, too. The Ripple Effect of Following a Brand on Social Media: A convincing argument in favor of including social media in your marketing plans: consumers are more likely to buy from a brand that a friend of theirs “Liked”. Great information, as always Matt. Another component that I would suggest is “Appeal.” It’s an old cliche, but “you only get one first impression.” Appeal will help with status such as time on site and bounce rate. I agree that appeal is important however, I would argue that if your content hits all four points above, you will be sure to appeal to your target market. With all due respect, an infographic is more than words with colors. An infographic should depict information in ways that words alone can not convey. This misuse of the word “infographic” might be infringing on the “credible” aspect of your content! Thanks for weighing-in on the often discussed topic: “What is an infographic”? To me, it’s all about helping busy business folks retain information and that is my number one goal when using infographics. Information is good, but that info graphic… yikes! Someone needs to throttle back the bevel in Photoshop. And possibly look at a few design tutorials online. What makes the best website content? 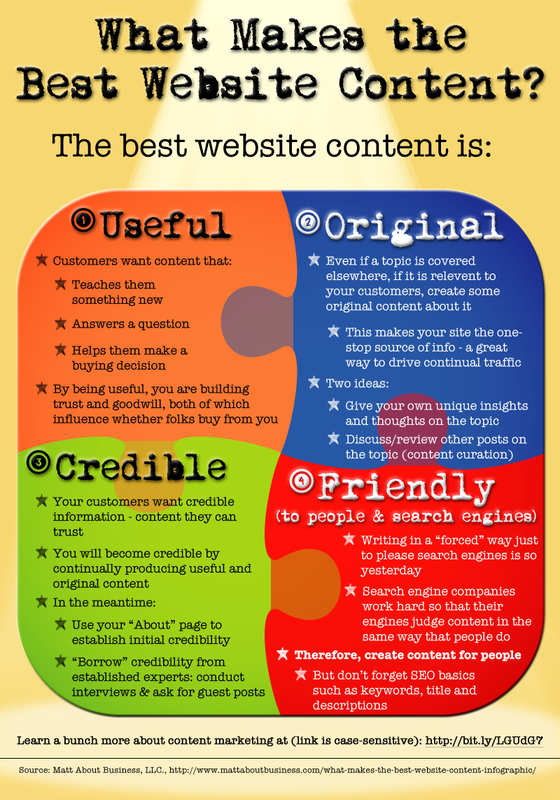 This infographic details four key elements that all types of content must have to be effective at driving traffic to your site…. What makes the best website content? This infographic details four key elements that all types of content must have to be effective at driving traffic to your site.